Free Video Accelerator for YouTube works automatically with web browser to let you watch web videos smoothly without frustrating pauses and interruptions. Utilizing SpeedBit's award winning technology this unique solution downloads videos from multiple sources simultaneously to ensure the smoothest Playback of all your favorite web videos. 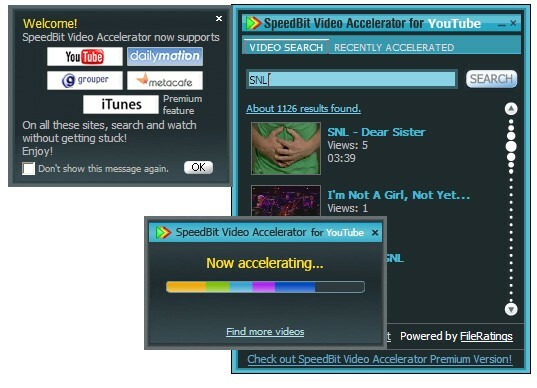 Video Accelerator for YouTube features: Video Acceleration, Seamless integration, Widespread availability. Watch web videos smoothly without frustrating pauses and interruptions. just install Free Video Accelerator for YouTube once, and stop waiting for your videos to load. Qweas is providing links to Free Video Accelerator for YouTube 3.0.9.9 as a courtesy, and makes no representations regarding Free Video Accelerator for YouTube or any other applications or any information related thereto. Any questions, complaints or claims regarding this application Free Video Accelerator for YouTube 3.0.9.9 must be directed to the appropriate software vendor. You may click the publisher link of Free Video Accelerator for YouTube on the top of this page to get more details about the vendor.